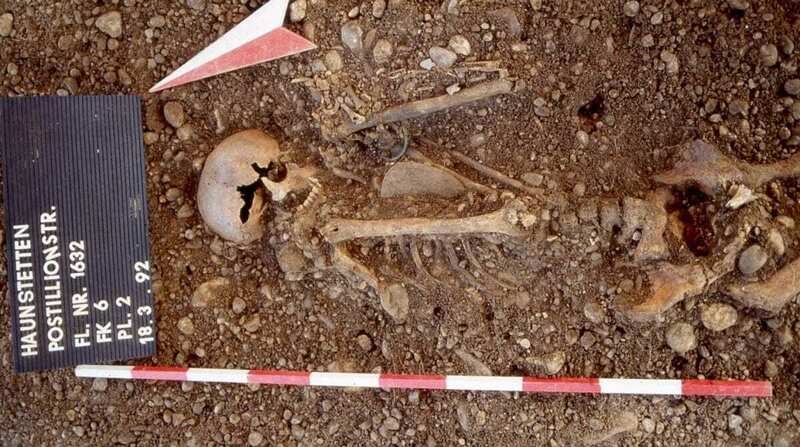 A team of researchers led by scientists at the Max Planck Institute for the Science of Human History has sequenced the first six European genomes of the plague-causing bacterium Yersinia pestis dating from the Late Neolithic to the Bronze Age (4,800 to 3,700 years ago). 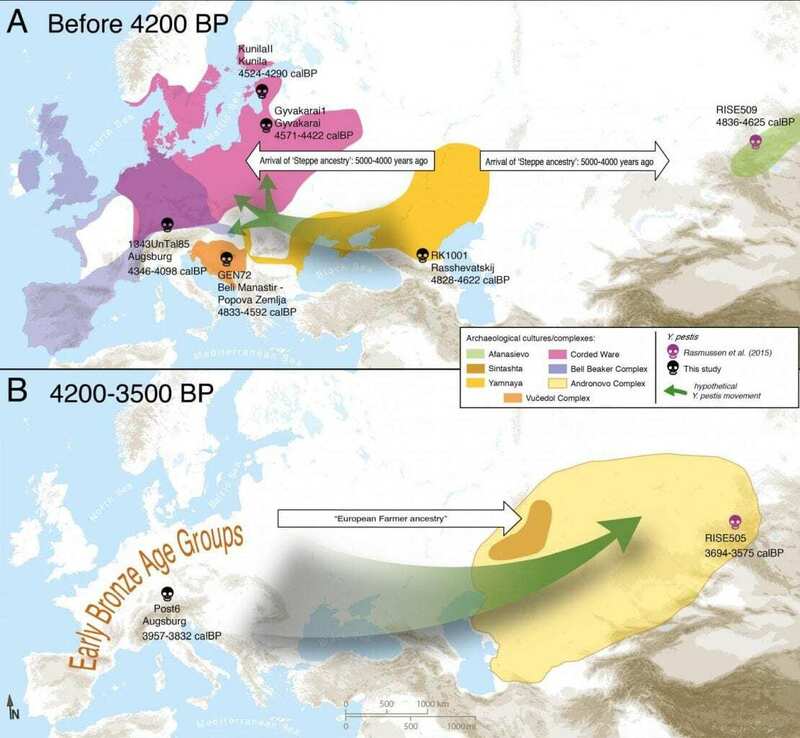 Analysis of these samples, published in Current Biology, suggests that the Stone Age Plague entered Europe during the Neolithic with a large-scale migration of people from the Eurasian steppe. Plague caused by Y. pestis has been responsible for major historical pandemics, including the infamous Black Death in the 14th century AD. By analyzing ancient forms of the disease, the researchers hope to learn more about the evolution of the plague and how it became more virulent over time. For this study, the team analyzed over 500 tooth and bone samples from Germany, Russia, Hungary, Croatia, Lithuania, Estonia and Latvia and screened them for the presence of Y. pestis. They recovered full Y. pestis genomes from six individuals, greatly increasing the number of Y. pestis genomes available for study over this time period and providing an unprecedented opportunity to study how the disease evolved after its introduction into Europe. The scientists found that the Y. pestis genomes from this time period, which were found in different parts of Europe, were all fairly closely related. “This suggests that the plague either entered Europe multiple times during this period from the same reservoir, or entered once in the Stone Age and remained there,” explains Aida Andrades Valtueña of the Max Planck Institute for the Science of Human History, first author of the study. In order to clarify which scenario was more likely, the scientists examined their data in the context of the existing archaeological and ancient DNA evidence regarding the movement of peoples during the same period. Map of proposed Yersinia pestis circulation throughout Eurasia. A) Entrance of Y. pestis into Europe from Central Eurasia with the expansion of Yamnaya pastoralists around 4,800 years ago. B) Circulation of Y. pestis to Southern Siberia from Europe. Only complete genomes are shown. CREDIT :Aida Andrades Valtueña. Andrades Valtueña et al. (2017). The Stone Age Plague and its Persistence in Eurasia. Current Biology. Beginning around 4,800 years ago, there was a major expansion of people from the Caspian-Pontic Steppe into Europe. These people carried distinct genetic markers that allow their movements and genetic influence, present in essentially all modern-day Europeans, to be traced. Interestingly, the earliest indications of the plague in Europe coincide with the arrival of steppe ancestry in the human populations. This supports the concept that the plague spread along with the large-scale migration of steppe nomads. “In our view, the human genetic ancestry and admixture, in combination with the temporal series within the Late Neolithic-Bronze Age Y. pestis lineage, support the view that Y. pestis was possibly introduced to Europe from the steppe around 4,800 years ago, where it established a local reservoir before moving back towards Central Eurasia,” explains Alexander Herbig of the Max Planck Institute for the Science of Human History, a corresponding author of the study. The plague genomes recovered by the researchers confirm that changes were occurring during this period in genes related to plague virulence, as suggested in prior research. Further research will be needed to confirm how these changes affected the severity of the disease. However, it is possible that Y. pestis was already capable of causing large-scale epidemics before it developed these traits. Johannes Krause, director of the Department of Archaeogenetics at the Max Planck Institute for the Science of Human History and lead author of the study, explains, “The threat of Y. pestis infections may have been one of the causes for the increased mobility during the late Neolithic-early Bronze Age period.” In other words, the steppe people could have been moving to get away from the plague. Furthermore, the introduction of the disease in Europe could have played a role in the genetic turnover of European populations. “It’s possible that certain European populations, or the steppe people, may have had a different level of immunity.” Further research to analyze even more samples, from both Y. pestis and humans, from a broader temporal and geographic range will be needed to better answer these questions.